This software can be utilized for ScopeCorder DL350 data and setup file management by a PC. Data files or setup configuration files stored in the DL350 SD card can be backed up with the press of a button. Remote setting, start-stop control and setup file editing can also be easily done on the connected PC. This software supports setup operations and on-site tasks of the DL350. You can use this software to perform the functions listed below. Load Setup File You can directly apply a DL350 setup file stored in the PC to the DL350. DL350 Start/Stop You can start or stop measurement performed on the DL350. Backup You can back up the data stored in the SD card or USB memory installed with the DL350 to the PC. 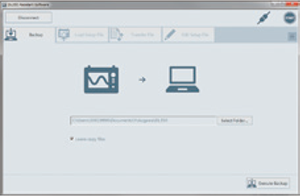 Transfer File You can transfer (copy) files bidirectionally between the DL350 and PC. Edit Setup File You can edit the DL350 setup file stored in the PC. Install this software on a PC having an environment where one of the OSs listed below runs. CAN/CAN FD Monitor Module (720242) was added. A timeout setting was added to the duty cycle measurement of the FV setting on the frequency module. The fast channel multiplexing function of the SENT monitor module is now supported. A battery level check function was added. GPS settings were organized into a table. Setting category items (Measure, Analysis) were added to Edit Setup File.